On November 22nd, I will have the privilege of speaking at an event hosted by the Society of St. Pius X and Our Lady of Fatima Church in Portland, OR. If you’re in the area, please join us. In any event, please spread the word. This promises to be a memorable evening. In this presentation I’ll discuss the stark contrast between what Pope St. Pius X understood to be the requirements of his exalted office, and the approach currently taken by Pope Francis. Rather than simply celebrating the glorious memory of Pope St. Pius X with a strict focus on the past, we’ll reach the inevitable conclusion that the gifts and the insights that guided his pontificate are of a timeless nature, therefore, a Holy Father with the wherewithal to reign after the manner of this saintly pope is precisely what the Church and the world in our day desperately needs. God Bless you, Louie, safe journey. May be you could pick up some of the issues mentioned here and which I have discussed with you. 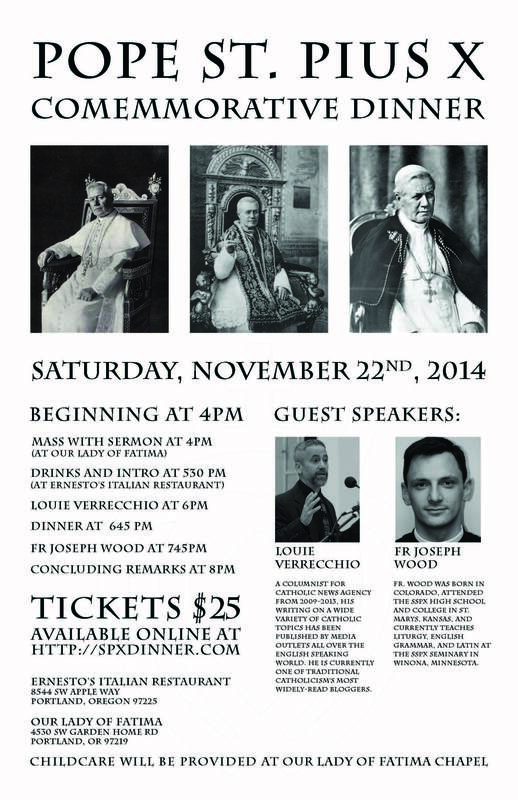 What good are SSPX Conferences when they do not discuss such a fundamental issue? If this issue was thrashed out a year back the SSPX could today turn the tables on the Bishop of Albano.Now they are at the receiving end due to ignorance. Louie, I am sure that I speak for many of your followers of this blog that we wish we could be in attendance, but for numerous reasons are not able. However, we must be united in prayer for you and all in attendance. 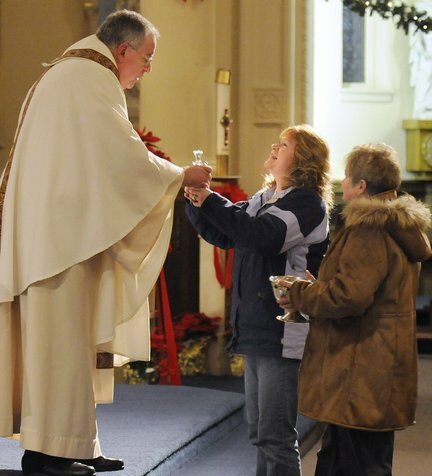 The post-conciliar church is in a severe crisis which seems to be getting worse every day. There is no where to turn except for those who courageously speak the truth, knowing it is Christ’s Church which must be defended from Her enemies. The SSPX must never accept the documents of Vat 2 which are tainted with the spirit of modernism. Should we drink orange juice which is tainted with only 2% arsenic? God be with you and all at this conference. The SSPX must never accept the documents of Vat 2 which are tainted with the spirit of modernism. Ad Gentes 7 says all need faith and baptism for salvation. Is this modernism for you ? So why does the SSPX say that Vatican Council II indicates all Hindus, Buddhists, Jews, Mulsims and others need to convert into the Church, with faith and baptism, for salvation? Why do they not say this? It is because Vatican Council II can be interpreted with an irrational premise or without it. And they are choosing the interpretation with the premise. So for them Lumen Gentium 16 is an exception to all needing to convert into the Church. For me it is not an exception. For them those who are saved with invincible ignorance are known and visible on earth to be exceptions. For me they are only posibilities known to God and I cannot see people who are in Heaven. So for Bishop Fellay, Vatican Council II is a break with the traditional teaching on other religions and Christian communities. So the SSPX can accept the documents of Vatican Council II when the premise is not used in the interpretation. So could you. Should we drink orange juice which is tainted with only 2% arsenic? Without the premise you can drink only orange juice. 1.’We accept Ad Gentes 7, Vatican Council II which says all need faith abd baptism for salvation and so affirms the traditional interpretation of the dogma extra ecclesiam nulla salus. We call upon Bishop Marcello Semeraro, the Bishop of Albano to do the same. Affirm Vatican Council II. 2.’We accept Vatican Council II in which LG 8,LG 14, LG 16,NA 2,UR 3 are possibilities and do not refer to explicit exceptions to Ad Gentes 7, Vatican Council II. We call upon Bishop Semeraro to please do the same. Affirm Vatican Council II as we interpret it. ‘Ad Gentes 7 says all need faith and baptism for salvation. Vatican Council II indicates all Hindus, Buddhists, Jews, Mulsims and others need to convert into the Church, with faith and baptism, for salvation. ‘Bishop Fellay has said that the SSPX accepts Vatican Council II as a historical event and that he accepts 90% of the Council. ‘So an appeal is made to the bishop of Albano to also affirm Vatican Council II in agreement with the dogma extra ecclesiam nulla salus ( with no exceptions) as mentioned in the SSPX General Chapter Statement 2012. ‘We appeal to the Bishop of Albano to interpret and affirm Vatican Council II as we do and set an example for all. I understand that the error in Feeneyism was that of selecting many(at least 20) teachings of Church Councils and Fathers to support his view, but not considering other Church teachings that had a different emphasis. Was it not true that the preVatican II magisterium concluded he had made the Protestant error of private interpretation of Traditional teachings? I am clearly out of my depth here as I struggle to deepen my understanding, but is there a simple way of putting it?? Lionel: I am not referring to theology. I keep repeating that we cannot physically see any one on earth who is also in Heaven. So we cannot see or know people this year who are saved with the baptism of desire or in invincible ignorance. The SSPX and the St.Benedict Centers, the communities of Fr.Leonard Feeney, have created theologies, based on the ability of human beings to be able to see the dead. We cannot see the deceased saved with the baptism of desire and yet these hypothetical cases are considered relevant to the dogma. See the section ‘Feeneyism’ on the SSPX USA website.This error is there and is not acknowledged by the SSPX or the communities of Fr.Leonard Feeney in the USA. Lionel: Feeneyism was never an error of the Church. Fr.Leonard Feeney was repeating the traditional teaching of the Catholic Church on the dogma extra ecclesiam nulla salus. He was not saying any thing new. It was the Letter of the Holy Office 1949 which made a factual mistake. It assumed that those who are saved with the baptism of desire etc are visible to us in real life to be explicit exceptions to Feeneyism. It is a fact of life that we cannot see the dead for them to be exceptions. We can accept these cases as possibilities known only to God but they are not visible to us in 2014 to be exceptions. The Letter of the Holy Office made an objective error and this error was picked up by the SSPX including Archbishop Marcel Lefebvre. He assumed it was a magisterial teaching.Yet it was a break with the traditiional teaching on other religions and Christian communities. Yes the ‘magisterium’ concluded that the deceased now saved with the baptism of desire etc and who are in heaven, were known cases on earth, they were visible, to be exceptions on earth, to the ‘rigorist interpretation’ of Fr.Leonard Feeney.This is fantasy theology. It is non-sense. This is liberalism. This is a new doctrine. It is irrational. It is modernism accepted by also the traditionalists.How can hypothetical cases be defacto exceptions.Where in tradition is this mentioned? Mystici Corporis does not say that we know these cases; that they are explicit for us. The Council of Trent only mentions implicit desire ( baptism of desire) it does not state that they are known to us or are explicit exceptions to the dogma. So the teaching of the Letter of the Holy Office is Cushingism. It is not part of the Deposit of the Faith. The baptism of desire implicit and invisible for us is acceptable. The baptism of desire explicit and objective is not real and not part of the Deposit of the Faith. We cannot see the dead in heaven. So the baptism of desire and being saved in invincible ignorance are not exceptions to extra ecclesiam nulla salus. The theologies and explanations on Feeneyism are all straw. Since, when there is no objective case, what is the purpose of creating and defending theologies, on this subject. I believe the problem is that the SSPX are somehow being forced to sign on the dotted line that they must also accept the liberal interpretations of VII as equally valid. What the SSPX is rightfully fighting for is to correct the errors of VII or the amend VII’s language to be more precise in what it teaches. But Rome is unwilling. There is also the issue of the Celebration of the Mass, so even if the VII issue was sorted, there are still issues that Rome may try to clamp down on TLM, and force heterodoxy into the SSPX by imposition through its seminaries etc. in addition to forcing the Novus Ordo Mass to be celebrated. The VII/Mass are what we see on the surface, but ultimately it is also about who gets t be in control of the functions of the SSPX. They are being forced to admit that there is only a Vatican Council II, interpreted with an irrational premise and they have to accept this version. They are not told by the magisterium that there is another interpretation of Vatican Council II and it is without the irrational premise. This one is traditional on other religions and Christian communities and which the Vatican Curia cannot accept for political reasons. It is a lost cause if they continue to interpret Vatican Council II with the irrational premise.They are part of the problem. This threat is always there.May be they can reach an agreement to prevent this. They can reach an agreement with the Vatican to prevent this. Anything in the Vat2 documents which were “traditional” did not have to be repeated. They were already included in the Deposit of Faith given to us by Christ and handed down to us by the Apostles. There was no need to re-affirm what was already clearly and dogmatically taught by the Catholic Church. “Traditional” statements made in the documents were to cloak the modernist “time bombs” which have exploded in the Synod on the Family. Anything in the Vat2 documents which were “traditional” did not have to be repeated. Yes but was it traditional to assume that LG 8,LG15,LG16 refer to explicit exceptions to Ad Gentes 7 which says all need faith and baptism for salvation? This is not traditional! Yet this is the interpretation of Vatican Council II made by the traditionalists. They were already included in the Deposit of Faith given to us by Christ and handed down to us by the Apostles. There was no need to re-affirm what was already clearly and dogmatically taught by the Catholic Church. The traditionalist interpretation of the Letter of the Holy Office was a break with Tradition. The error was repeated in the Catechism of the Catholic Church(1257-1260) and the SSPX and others accepted it. They used the same tradtional reasoning in the interpretation of Vatican Council II. They rejected the Council and accepted the Letter. Ironic! “Traditional” statements made in the documents were to cloak the modernist “time bombs” which have exploded in the Synod on the Family. Non traditionalists interpretations of traditional teachings is standard in the interpretation of Vatican Council II. The SSPX and the communities of Fr.Leonard Feeney are making this error in the interpretation of the Council II.So are the sedevacantists. You comment that we are unable to see those putatively saved by Baptism of Desire or those in invincible ignorance…” We cannot see the dead in heaven” and therefore cannot prove they are there…. So why is our inability to see those in category one an obstacle, yet not in category two? Yes we cannot see then physically on earth.This is relevant since it is generally inferred that the baptism of desire and being saved in invincible ignorance are exceptions to the dogma extra ecclesiam nulla salus. In other words they are seen and known in 2014 to be exceptions to all needing the baptism of water. We cannot see the dead in heaven” and therefore cannot prove they are there…. Lionel:Yes we cannot see them . They are only possibilities for us. They are known only to God.They do not exist in our reality. Since they do not exist in our reality they cannot be exceptions to the literal and traditional interpretation of the dogma according to Fr.Leonard Feeney. The Holy Office and Cardinal Richard Cushing made a mistake. True in faith we accept that the saints are in Heaven even though we cannot physically see them or the others in Heaven. It is when someone says that there are exceptions to the dogma I say that we cannot see the dead on earth and so they cannot be exceptions to extra ecclesiam nulla salus. In faith I can accept that the saints are in Heaven however I cannot say that there is someone who is going to be a saint or who is going to be saved without the baptism of water. I do not know any one as such. I cannot see any such case this year. So whether someone is in Heaven physically or not is only relevant because of the confusion caused by the Letter of the Holy Office in assuming that the baptism of desire etc are visible to us and so are exceptions to Feeneyism. ‘ all those who have been saved over 2000 years by being in the Catholic Church’ are not relevant to the dogma or Ad Gentes 7 ( all need faith and baptism for salvation) since they do not exist in our reality in 2014 to be explicit exceptions to the centuries old interpretation of the dogma. None of them are examples of salvation outside the Church, since there are none of them in our reality on earth. So even if there were 500 persons saved with the baptism of desire they are irrelevant to the dogma. Since we do not know who they are in 2014. You will have to be aware.Much of what you read on the Internet on extra ecclesiam nulla salus is leftist propaganda. There are also Jewish Left groups who threathen Catholics and others who support Fr.Leonard Feeney. Also most people’s concept of Feeneyism comes from the SSPX and the St.Benedict Centers who do not realize still that the baptism of desire etc are not exceptions to the dogma.They can only understand this issue theologically and that too based on the false premise. They do not want to admit that all these years they were wrong and there are no known exceptions in Vatican Council II to the dogma. Cardinal Müller’s Manifesto: Light or darkness? The Papal Subject on Did Francis just throw a “Pride Month” bone to gays? Gods servant first on Did Francis just throw a “Pride Month” bone to gays? Tom A on Did Francis just throw a “Pride Month” bone to gays?